i don't consider myself a cheap person. frugal, yes, but when it comes down to it i will always choose quality over quantity. i'd rather pay the extra money now than later on repairs (or doctor's visits if we're talking cheap food). that being said, i love the dollar store. but i'm kindof a snob about it because i won't go to just any dollar store. it has to be the Dollar Tree, where everything is one dollar. i am not fooled by the other so-called dollar stores where some things are the same price as Wal-Mart, or the one in our mall that is called "A Dollar" but there's a big sign out front that says "most things $1.39 or more." come on! you're either a dollar store or you're not. this is my top 10 list of things you should always consider buying at the dollar store, unless, of course, you can find it cheaper elsewhere. 1. shaving cream. the old barber shop kind that foams up really good. why? because it is awesome for occupying the kids on rainy days, and using for craft projects. also good for keeping in the guest bathroom. 2. feather dusters. these little fluffy things can cost up to $15 at big specialty stores, but the ones that cost $1 do the very same thing. i like these for dusting picture frames and faux plants. 3. envelopes. the Dollar Tree in my neighborhood always has a great supply of security envelopes, padded catalog-size mailing envelopes, and large envelopes. it's always good to have envelopes on hand and don't bother paying more than $1 for something that is going to be tossed in the recycle bin eventually. 4. Bibles. yep, the Dollar Tree almost always has Bibles. paperback, large print, en Espanol, and pocket-sized. i've also seen Bible on CD at the Dollar Tree. these make great stocking stuffers, gifts to "secret sisters," and gift basket fillers. another good thing for the guest room. i also like to give them to new moms when i deliever a meal. all moms could use a good Word, right? 5. party favors. check out the toy section and the bath/beauty section at the dollar store for perfectly priced party favors. bouncy balls, Silly Putty, Play-Doh, little rubbery dinosaurs, glitter hair gel...the possibilities are endless. and cheap. 6. gift wrap. one time i got a pack of 400 sheets of multi-colored tissue paper for $1. i won't have to buy tissue paper ever again. 7. greeting cards. speaking of occassions, just go ahead and stock up on your greeting cards. sometimes they are 2/$1! and i promise they aren't stamped with "$1 STORE" on the back; the recipient will never know that you didn't go to Hallmark. 8. craft supplies. unless you can find it cheaper elsewhere, the dollar store is a great place to find construction paper, pipe cleaners, googly eyes, crayons, markers, stickers, and other supplies for your arts and crafts. i've even found foam paper, felt, and acrylic paint. 9. nail polish remover. i think the dollar store is the only place i've been able to find the harsh stuff that gets off months-old nail polish. it's the most toxic but it gets the job done and it's only $1. 10. hair accessories. for yourself or your little girls, the dollar store generally has a variety of hair clips. from the very basic to the most trendy, get it for a dollar - it'll hold your ponytail all the same. i'm part of the Top Ten troupe at OhAmanda! 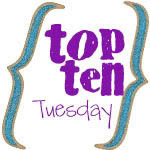 if you love Top Ten lists like I do, check them out here. oh, and i was not paid in any way by the Dollar Tree to write about them. but if the chance ever came up, i would write for them and they could pay me in store credit. i'm just saying.